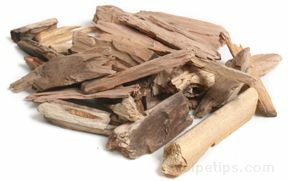 A wide range of woods are suitable for grilling and smoking food. Hardwoods are much better to use than softwoods because hardwoods burn longer and provide more heat. Hardwoods also add more flavor to foods because of the aromatic smoke that is produced as the wood burns. 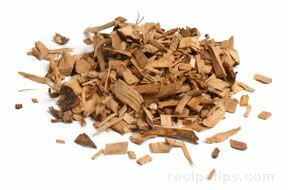 Softwoods burn quickly and the flavor that the smoke imparts into food is often undesirable. Wood can be used as the primary fuel source for a fire intended for cooking or it can be added in small quantities to fires fueled by another material, such as charcoal. In either case, the smoke produced from the burning wood imparts unique flavors into the food. 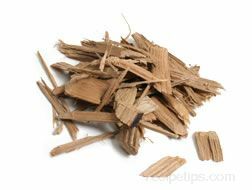 Lumber Scraps: It makes no difference if scrap lumber is new or previously used; it should never be used for cooking or smoking food. It may be tempting to use new pieces of lumber for grilling and smoking; however, it may be difficult to determine the wood type, and consequently, the effect it would have on food. Used lumber may have been in contact with harmful substances that have permeated the wood; therefore, it could pose a danger when burned. Pressure Treated/Chemically Treated Lumber: Because the chemical treatment acts as a preservative, this type of lumber is generally used as outdoor decking material or for other exterior building projects. It is hazardous when burned, releasing toxic smoke and fumes, which will be absorbed by the food. Painted or Stained Wood Scraps: It is a dangerous practice to use painted or stained wood, such as furniture pieces, as fuel for grilling. Harmful toxins can be released when the painted or stained wood is burned and the smoke from the fire will cause food to acquire undesirable flavors. 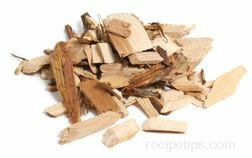 Mold or Fungus Covered Wood: Wood that is covered with mold or fungus should not be used as fuel for cooking food or for adding smoked flavor to foods while grilling or barbecuing because it can produce some really undesirable flavors in the food. 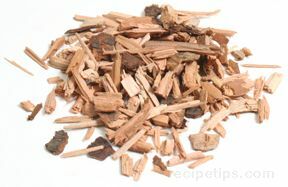 Alder is most often used for grilling and smoking salmon. It is also used for other species of fish, poultry, small game birds, and pork, providing a subtle, sweet flavor to the meat. 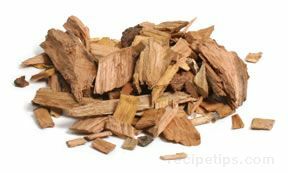 Apple wood provides a sweet, fruity flavor to most meats but is especially good for smoking ham. The wood is dense and very hard in texture. Generally readily available, this hardwood provides a flavor similar to oak and several other hardwoods. The wood of the beechnut produces a mild, somewhat delicate smoked flavor. Since it is a hardwood, it remains longer for smoking before it turns to ash. Much like the woods provided from fruit trees, the small diameter trunks of the blackberry bush provides a slightly sweet and delicate flavor for grilling poultry and other meats, such as small game birds like grouse, pheasant, partridge, and quail. 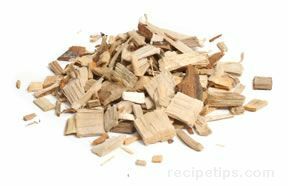 A softer wood, birch is best used when grilling or smoking cuts of pork and poultry, providing a flavor similar to some varieties of maple. A very common wood used to grill fish, poultry and various meats such as pork and beef. White or red cedar are the species most often available, which provide a distinctive natural and aromatic flavoring for a variety of foods. Salmon and other types of fish are often grilled or smoked using cedar. Cherry is used for all types of meat and like apple, it provides a subtle, sweet, fruity flavor to foods. 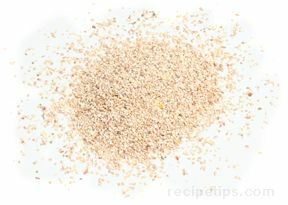 Cherry can be used to grill and smoke turkey, chicken, small game birds, and pork. 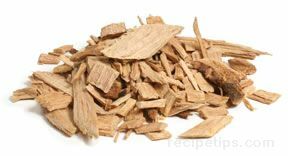 Although not considered to be a true wood, it is often used as a smoking chip when grilling foods such as poultry, fish and small game birds. The heart of the cob that holds the kernels is the fuel section of this alternative for wood. It is ground into small granular bits that can be added to a smoking box or it can be combined with other woods such as woods from fruit trees, to impart several flavors. The Corncob provides a sweet flavor that may overpower the food if too much is used to season the food as it cooks. Begin by trying small amounts until the desired flavor is achieved. Small in size, the chips from matured grape vines provides a flavor that is much like other species of trees bearing fruit. Somewhat sweet and fruity, the grape vine is most often used for poultry, small game birds, pork and sausage. Hickory is more common in the South, but is popular in many regions. It is used just as often if not more often than oak. Hickory provides a strong smoky bacon flavor and can be used for all types of meat, but is especially good for cuts of pork, wild game, chicken, and ribs. Maple provides a mild, smoky and somewhat sweet flavor to foods. 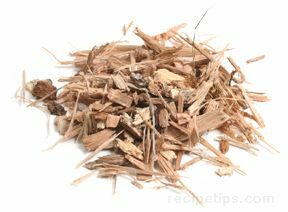 It is best used with pork, poultry, small game birds, and is often considered to be a good wood for grilling vegetables. 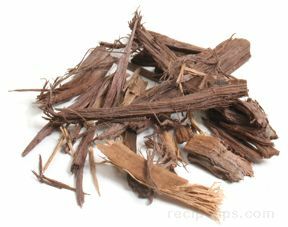 Mesquite burns very hot and provides a strong flavor to foods. Because of its more intense heat properties, it may burn too hot for some foods. It is very popular in Texas and the Southwest United States where it is most often used for grilling or smoking cuts of beef; however, it is also a good choice for a variety of other meats and vegetables as well. When mulberry wood is burned, it produces a sweet smelling smoke similar to apple. It is a good choice for imparting flavor into poultry, fish, and pork. Oak is one of the most often used woods because it is common in many regions of the country. It provides a good flavor without overpowering the food. It is used for all types of meat, poultry, and fish. Similar to other fruit trees, the wood from a peach tree provides a somewhat sweet, fruity flavor. 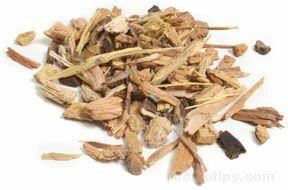 It is most often used for grilling pork or poultry; however, small game birds such as grouse, partridge, and quail are often grilled or smoked with peach wood chips. Similar to peach and other fruit trees, the wood from a pear tree provides a somewhat sweet, fruity flavor. 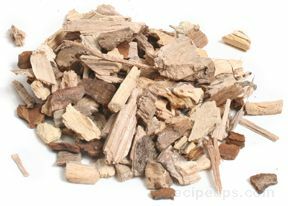 It is most often used for grilling pork or poultry; however, small game birds such as grouse, partridge, and quail are often grilled or smoked with pear wood chips. Pecan is popular in Louisiana and other Gulf Coast states. It provides a flavor similar to hickory, but not quite as strong. It can be used with most cuts of meat. 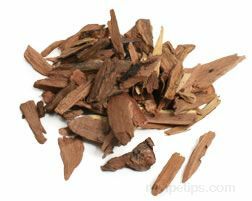 Pimento is a tropical wood taken from theplant, Pimenta dioica, which is also referred to as Allspice, Jamaican Pepper, Myrtle Pepper, or Newspice. 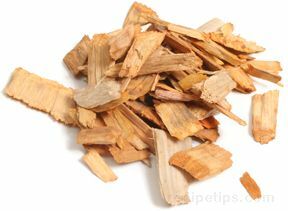 In some regions where this is available, the Pimento wood is used for grilling poultry and fish. 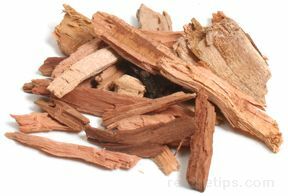 Pimento wood adds a natural peppery flavor to food and it may also impart the flavors of several combined spices, such as cinnamon, cloves, and nutmeg, which is similar to the flavor provided by allspice. Pimento is commonly used when grilling Jamaican foods such as jerk chicken. Although not often thought of as a type of wood, seaweed is commonly used for smoking shellfish, such as clams, crab, lobster, mussels, and shrimp. The seaweed is washed to remove the salt and is then air or sun dried before use. It provides a some what spicy and natural flavor to the foods being smoked or grilled. Walnut is best used for red meats and strong tasting, heavy game because of the strong and somewhat bitter flavor it provides. 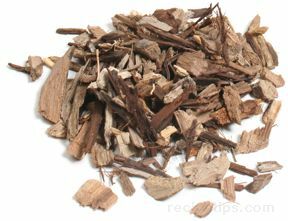 It is often mixed with woods with milder flavors in order to provide a more subtle flavor to foods. Woods that have been seasoned with aged beverages such as wine or whiskey impart the flavors of the blends through the years of use. 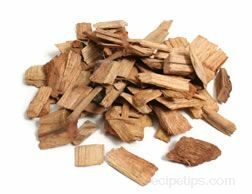 Most often made from oak, the wood provides a light oaky taste that goes well with beef, poultry, and cheeses that are grilled or smoked. Used to hold food while it is being grilled, a plank grilling board provides a moist and somewhat smoky flavor to the food as well as preserving the nutrients within the food. The use of wooden planks was introduced hundreds of years ago as a method to grill food over open fires. Plank grilling boards can be made from any of the types of wood described in this chart, as long as the wood is not chemically treated.